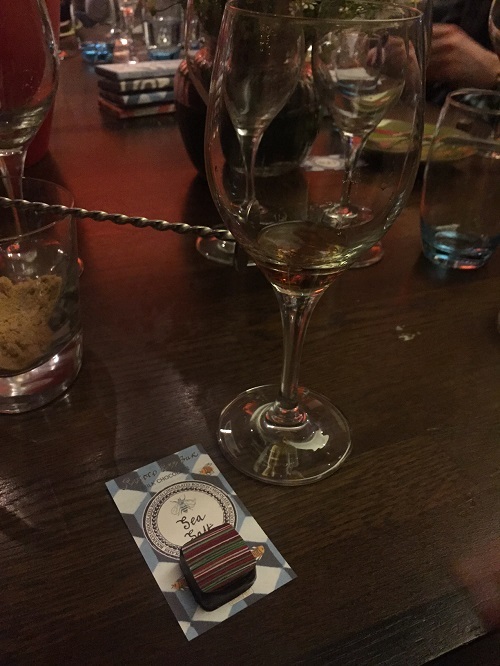 We went to a rum and chocolate pairing class this week at Rotunda Bar and Restaurant in Kings Cross. 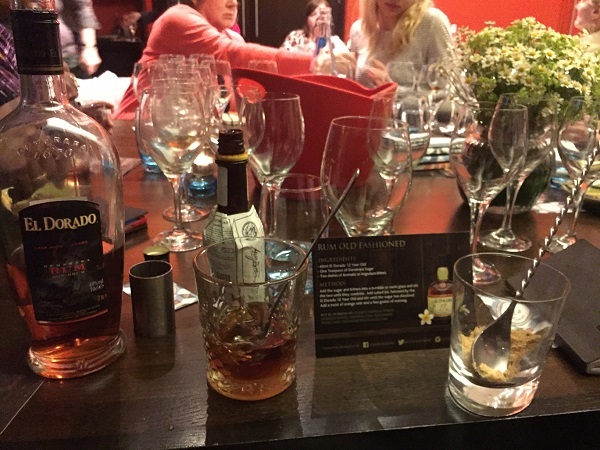 It was hosted by Dean Macgregor, brand ambassador for El Dorado rum in the UK and Sam Smallman from Rococo Chocolates, a face familiar from the rum and chocolate pairing seminar we attended at last year’s Rumfest. Rotunda has a nice canalside location, with outside seating and bar area, a curved indoor bar, small restaurant area and private function room, where our class took place. I think the cold wind at the end of April had caught everyone out, and the organiser’s plans for us to sit outside and sip our welcome drink were scuppered. Nevermind, as we all bagged our seats early and did the introductions: Stanley (an El Dorado fan from its home nation of Guyana) and his wife Juliet (from Carriacou), a seasoned spirit tasting couple and a mother and daughter chocolate fan pair completed our table. To complete our table there were Christie and Steven, who are veterans on the spirit tasting scene! The (now-indoor) welcome drink was promptly delivered: a Queen’s Park Swizzle, which is a Trini punch with demerara rum (El Dorado 5 in this case of course), lime, mint and bitters. A Trinidadian take on a mojito by all accounts. Both Dean and Sam gave us an introduction to their products, with the ‘did you know’ facts of the day being that Ivory Coast produces 70% of the consumed cocoa crop in the world, and that the plant botanical name literally means ‘Food of the Gods’. I liked that they had key images to show us on an ipad, which allowed us to see what a cocoa bean looks like, the Guyanese landscape or the old wooden stills at the Diamond Distillery. 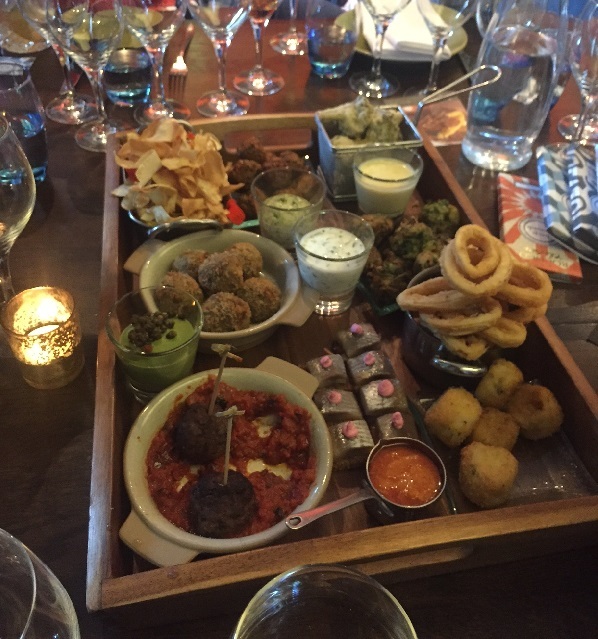 Proceedings were then given a welcome interruption by the arrival of a platter of nibbles to line our stomachs before the rum tasting proper. El Dorado 12 – an award winning rum, which won 7 Gold in the first 10 years of the Caribbean Rum Taste Test competition. The rum is a blend of 12 to 16 year-old rums, with a minimum of a year in ex-Bourbon casks. On the nose I got a lot of banana, with the typical sweetness of a demerara rum combined with woodiness in the mouth. The original wooden navy stills are still used for some of the blend, which definitely comes through in the taste, although it does seem to shorten the finish. 40% milk chocolate with Anglesey sea salt – salty sweetness is an unrivalled winner in my opinion and for me, drinking the rum after a bite of this chocolate took away some of the sweetness from the rum and left a little pepper. Dark chocolate with orange, the orange marmalade bar. A bit of lime juice added to the chocolate for acidity again cut through the sweetness of the rum. El Dorado 15 – Table-mate Stanley had promised us this one would be good, and Dean echoed this with the fact that it has been that it has collected the Wray & Nephew Trophy for Best Rum in the World at the International Wine & Spirits Challenge four years running, and is now known as the world’s only rum to achieve such a feat. It’s a blend of 15 to 20 year-old rums, which for me had a coconut aroma, with a more complex taste profile, including leathers typical with rums of this age. There was only one paired chocolate this time, but it was promised to be a ‘moment’. The 63% single origin (Peru) chocolate had a lot of fruity flavours – apricot was most prominent for me. 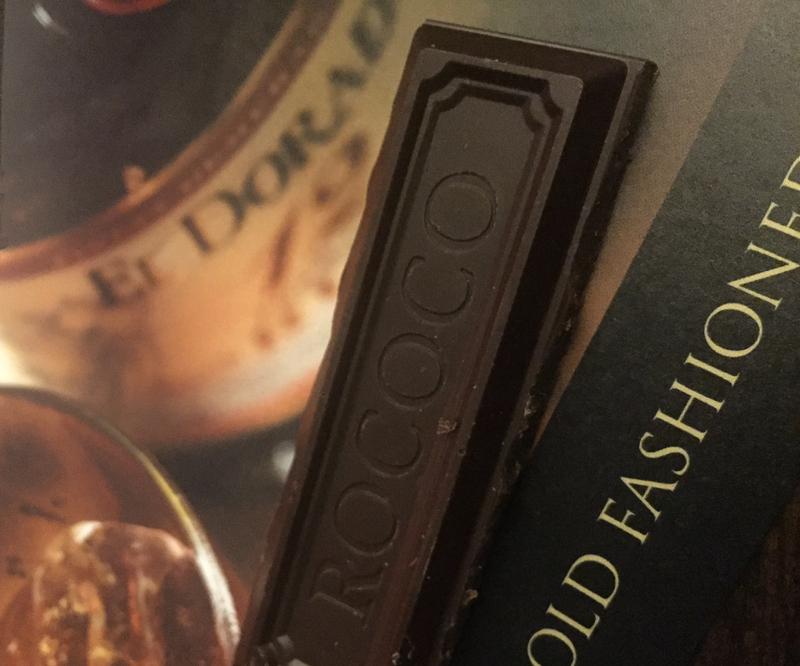 Upon tasting with the rum, these fruit flavours became more pronounced and the rum became spicier, again the sweetness of the chocolate cutting through the sweetness in the rum. Dean and Sam were right: this was a perfect combination. A bit of an interlude followed, with some chocolate tips from Sam: hot chocolate powders should always be mixed with water, a breakfast we should all be trying is bacon and stilton on ciabatta that has been spread with melted Madagascan chocolate (always up for trying such combos! ), and cocoa beans have different flavours depending on their terroir, just as is the case for our rums, coffees, wines and so on. El Dorado 21 – yet another award winning rum, which is a blend of 21 to 25 year-old rums. For me, the ageing had gone too far, with an overwhelming taste of oak and leather – verging on the whisky-type of rum I personally struggle with. This rum was back to a two-chocolate pairing: a 65% dark chocolate with cardamom and a red berry jelly ganache covered with Madagascan chocolate. Both of the chocolates, again, mellowed the rum and took away some of the harsh woodiness that had put me off. We also got to make our own Rum Old Fashioned using 60ml of El Dorado 8, a teaspoon of demerara sugar and a dash of Angostura bitters, finished with a square of dark chocolate.